My first render. MilCat with hair. Still needs some adjustments and some lights that won't crash my poor old PC. So good! I haven't got past playing with the presets yet! thanks :-) not quite how I wanted it to look, but I thought the ol' 32bit Vista PC would be a good testing ground for the Beta. Going to give it a go on the 64bit laptop and see the difference. Is it still possible to sign up for the beta? I've tried signing up 3 times in the past couple of weeks - waiting for the windows version - but I never get the email that says is being sent. I would really love to try this out now that the windows version is available. See your spam folder. I obtain beta 2 and 3, but 4 nothing. This was in spam. I always check all my folders - too many things have a habit of showing up as junk when it isn't. All I've gotten is echoing silence. Thank you for the Windows beta. Gave it a quick go following along with the video intro tutorial in DSPro 4.5.0.114 on Win7 64 (bottom of barrel AMD quad core/6 G RAM). I only tested on a default sphere (1 meter), and only encountered one issue. Not sure if it is a Windows version bug, or not. When I got to the CLUMP tab, and tried experimenting there, nothing happened. I tried all the sliders (following along with tut), and my hair model exhibited no changes at all. Then I wanted to put all the sliders back to their default, so instead of using the sliders I typed in the numbers in the selection boxes. Once I had them set back to default (or how I saw them in the tut), I decided to try the first slider again just for the hell of it. Low and behold, the clumping system started working. Although, I was not getting the fantastic instant update seen in the video (probably do to low end PC, and/or because I was using a 1 meter sphere) the lag wasn't that bad, and the clumping tools all seemed to work correctly. I'll test again to see if it was a slider issue that needed to be coaxed by the selection boxes, or if I was using way to big of a mesh to begin with. I did find one thing interesting though. I scaled down the sphere, and hid it to use the hair on Genesis. When I scaled down the sphere to about the size of Genesis' head the more I scaled it down the more the hair scaled up. This was also true for individual X/Y/Z scaling giving interesting, and wild results. I know that is not intended use, but it might come in handy some day. I've just set up two different tests, and the hair doesn't show up in the spot render or if I do a normal render. I thought I'd made a mistake on the first one, so deleted it, and tried again with the same results. Tried re-installing the plugin, and the hair still isn't showing in either render mode. Trying to spot render causes Daz to crash, but you can still see that the hair isn't there before it crashes. 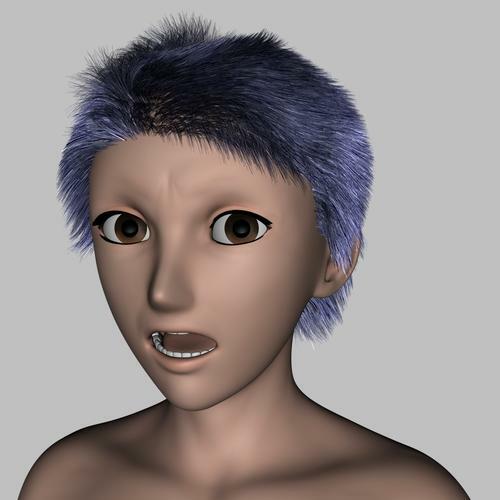 Well, I started a new scene, created a new hair and was able to render it no hassles. Went to create another new scene, created the hair again and again, it doesn't render. The blue strands show up in the normal view port, but no hair in the render. Sending positive and healing energy and prayers from half-way around the world. I can't even begin to imagine =(( I survived Ketsana and that was just one day of cold, darkness with water entering the house :( Glad you're okay and welcome back! The tightWavesExample01.duf is looking for textures that aren't there - the Journeyer scout textures I have are without an addition _DC at the end of the name ... but the hair looks great! The first time I created a primitive sphere and played with all the tabs until I came to the Tweak tab. That was reacting very slowly, and then ... crash. Restarting DS and redoing that and the crashes came early, even when just painting the Density map. Now it crashes each time I am trying to select a second part of the hairs to style. Sometimes I can't paint the density map ... closing Garibaldi and Edit / Edit Garibaldi hair again worked. Is it possible to select all the guiding hairs? Here is my 2nd try with the plugin. The first was more a birds nest than hair. I have been getting some crashes when trying to do long hair. Any chance to still get in on the beta? Windows 7 64 bit with 4.5.1.6 pro daz studio here. I used to do some beta testing for daz a few years back and I wouldn't mind the chance to give this a test run at all. Feel free to pm or email me. samc: that is a lovely girl! May I ask what morphs/textures you used? She's abit of this and that. I'm just doing some work at the moment. Can I get back to you later with the settings?. I'll PM you. The open beta will be available and free until the final product is released. Just go to the download page on the website. Make sure you check your spam folder of your email. Unfortunally spam filters have become very sensitive to automated emails. If your still having issues receiving the email then send me a email and I'll manually send you the details. I noticed I can only use this on Genesis atm. Will the plugin be updated to support other figures in the future? It should work on any daz figure, modern or legacy. Send me a email detailing the character you're having issues with and hopefully we will be able to resolve the issue for the next beta. Win 64-bit is, so far, giving me no surfaces to choose from (yes, I'm using a Genesis figure....!) when I call it up. Can you email the details of the steps you take before the trying to edit a garibaldi node. Also can you check if the example scenes are working correctly for you and email me if so. Please bare with things as the windows version is only a early test version. ...it usually seems to crash D|S before anything is accomplished. If you can isolate the crashing you're experiencing to a certain action it would be greatly appreciated if you could email the details. Hopefully I can get these early issues fixed as soon as possible. Playing with Genesis now - it's more stable than with the primitive sphere! Garibaldi does not support the legary file formats (but should not crash). If your having issues with the normal file format could you try saving a more simple scene or loading and resaving one of the examples. If you could email me how you get on with this would be great. Try normal spotlights with deep shadow maps. Hopefully they should work fine for you. Can you email me details of the lighting setup your having issues with. Looks great for a first try. Hopefully I'll get round to adding some more documentation soon about the more complex options and features. Is there a way to paint with Symmetary or on both sides at once...? Also when Painting when I change the Density of the Brush isnt that supposed to make the different shades correspond with the length of hair Generated...?Like white is longest and Dark grey shorter...? By the way: I think I cranked the distribution amount toooooo high on my sphere tests - that made it probably crash. And now my cursor changed to a cross ... LOL! Sounds like a more than adequate setup. Due to the nature that hair and fur is a complex system to replicate, having a older and slower machine will slow things down. Garibaldi needs a graphics card that supports: hardware vertex/fragment shaders, framebuffer objects, and multisample antialiasing. This means things are unlikely to function well with ati/amd or nvdia cards older than 5 years old. Any pre intel 'HD' (i series cpus) integrated graphics will not function. CPU speed can make a big difference in render performance. The interface is designed to be responsive with any reasonable cpu (turn down the preview percent/mask small test distribution textures if you have issues). A dual core cpu (like an intel core duo) will be fine, anything faster should be great. RAM is currently a biggest roadblock. 4GB on a 64bit machine without many other open applications is great. Anything less will get a bit more tight when tring to handle any large complex setups. Realistically I can't support machines with 2GB for version 1 of garibaldi express. But basic scenes will function fine. The target is that as the beta versions progress things will become more opitimised make better use of resources. Unfortunately the sphere primitive is not really a good test object with the default settings. A 1 meter sphere has a lot of surface area. The value of the distubution settings will create aproximely the amount set per square cm. So a distribution of 10 will put 10 hairs in every square centimeter. The clump amount needs to be less than the main hair distribution amount. The distribution of clumps on the characters surface use the same scale as the distribution of follicles. So if the clump amount is set to 1 then they will be about one clump in every square centimeter. Set fractional values for the amount will create larger clumps. Both the main follicle distribution amount and clump amount need to have a texture set. 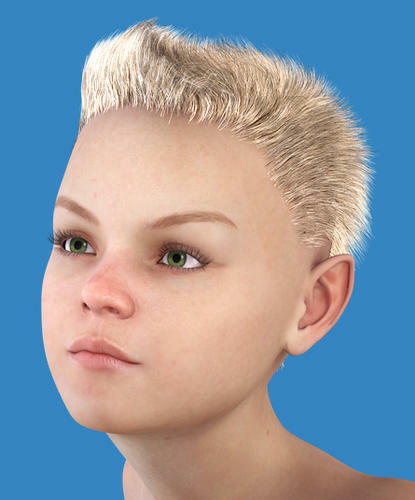 As default the hair density texture will be automatically selected in a new scene. Grey values can be used in these texture maps to vary the density of the distribution over the characters surface. I guess you mean the hair stayed the same size... the garibaldi hair will try to retain its original shape while staying attached to the underlying geometry/figure. This behaviour make more scene on a figure/character i guess, but seems a bit weird when it is applied to a simple scaling sphere. 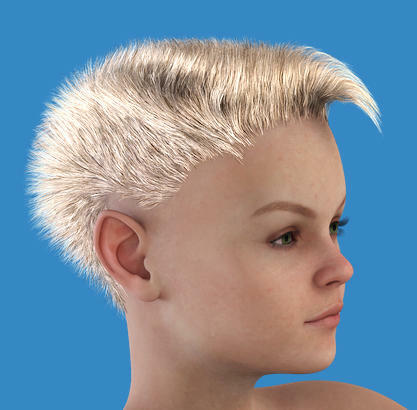 Can you email the details of what character your trying to apply hair to.